For the First Time, We've Found an Exoplanet at the "Frost Line"
Astronomers have documented thousands of exoplanets to date, but they have yet to find one near the "frost line" — an important boundary in understanding how planets form. The discovery of Kepler-421b now changes that. The planet is located about 110 million miles (177 million km) from its sun, a type K star that's dimmer and cooler than ours. This gas giant circles around its sun once every 704 days. In comparison, Mars orbits our Sun once every 687 days. It's located in an area crucial for the formation of planets, the so-called frost line. This is the special distance where the temperature is cold enough for ice grains to form. Any closer to the host star and these grains would be boiled off. But at or beyond the frost line, these ice grains can stick together and form planetary embryos which go on to form gas giants. This explains why our gas giants are rich in ice and water, any why the rocky planets (Mercury, Venus, Earth, and Mars) began their existence as very dry worlds; water only arrived later via comets. 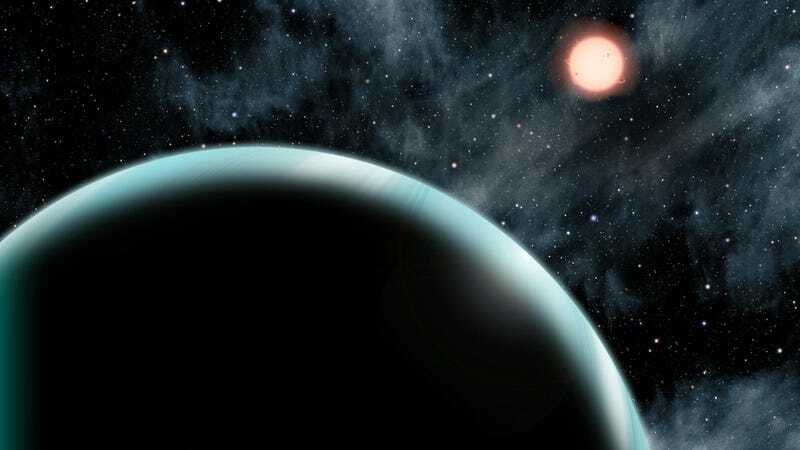 Astronomer David Kipping and his team discovered the planet by detecting the decrease in brightness of the parent star. It did this just twice in the 4.35 years for which NASA's Kepler Mission was focused on it. The amount of sunlight blocked indicates that the planet is about the same size of Uranus, which is about four times the size of Earth. It also has an orbital eccentricity similar to Uranus, so it's reasonable to assume that it probably looks like Uranus as well. Working with this assumption, the astronomers assigned an albedo that puts it at a frigid -130 degrees Fahrenheit. The frost-line is not a fixed point in space but actually moves inwards over time as the protoplanetary disc of a young star evolves. From this disc, planets form and their properties will be determined (in part) by whether they were inside or outside the frost-line during their birth. In the case of Kepler-421b, we estimate that the frost-line would be the same distance as the planet's present location when the system was about 3 million years old. It is thought that planets form over the first 3 to 10 million years, which means that Kepler-421b could have formed exactly where we see it today. That's quite remarkable because all of the other known gas giant transiting planets found to date must have formed further out and migrated inwards later on. More over, the fact that this Kepler-421b is a Uranus-sized planet and not a Jupiter-sized planet may because it formed in the final stages of this planet formation era and thus there was left material left over to build planets by this point. Of course, we don't really know how this planet formed because no-one was there to watch it happen, but these clues may help us decipher the history of this world. He says that it's still a bit premature to predict the frequency of such planets, but he figures these cold-Neptunes are everywhere — they're just hard to find. And like this discovery showed, you also need a bit of luck. Read the entire study at arXiv: "Discovery of a Transiting Planet Near the Snow-Line". Images: David A. Aguilar (CfA) & Pearson Education and Addison Wesley.